I think I've found a little bug with pixel alignment and merging layers. After turning Force Pixel Alignment off, layers are still displayed pixel aligned even when they are moved/cropped sub-pixel. Then when you merge that layer down, you get a blurry result as the pixel alignment shows up! Please note that I'm not 100% sure of the exact cause, just that its connected with pixel alignment. Do you have a copy of your AFPhoto/AFDesign (what application are you using?) 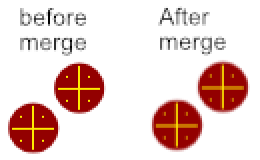 prior to merging it please? I've just had a quick try here and i'm unable to reproduce. I'm using Affinity Photo 1.5.1.54 trial. I've remade the file, please find it attached. Thanks for the file! I've reproduced the issue. It looks like it's being caused by the position of your bottom layer being sub pixel, however I agree it shouldn't be doing that so I shall get it passed onto development.